AquaStart is a combination soft starter that allows easy installation with factory pre-set pump parameters. It is designed to work directly with centrifugal and submersible pumps with ease of installation. AquaStart utilizes Thermal Image Motor Protection (TIMP) to get the highest level of motor performance while fully protecting the motor for longer life. AquaStart offers enhanced motor and system protection for residential, commercial, and industrial pumping applications. Standard NEMA 4 enclosure – Rugged, outdoor rated panel rated to 55°C without derating the starter. Set up the starter in just minutes – Preset for surface centrifugal motors with simple parameter change to accommodate submersible start up speeds. Use trimpots and DIP switches for parameter setting on standard units, or optional keypad for advanced settings. Two optional keypad controls available – Use the removable controller keypad for advanced settings and troubleshooting on the control module, or use the “through door” keypad for programming without opening the panel. Standard, built-in AC1 Run Rated Bypass – Automatically bypasses the soft start controller when motor is up to full amps. Soft Starter is only engaged during start and stop of motor. The works to reduce heat inside the panel. 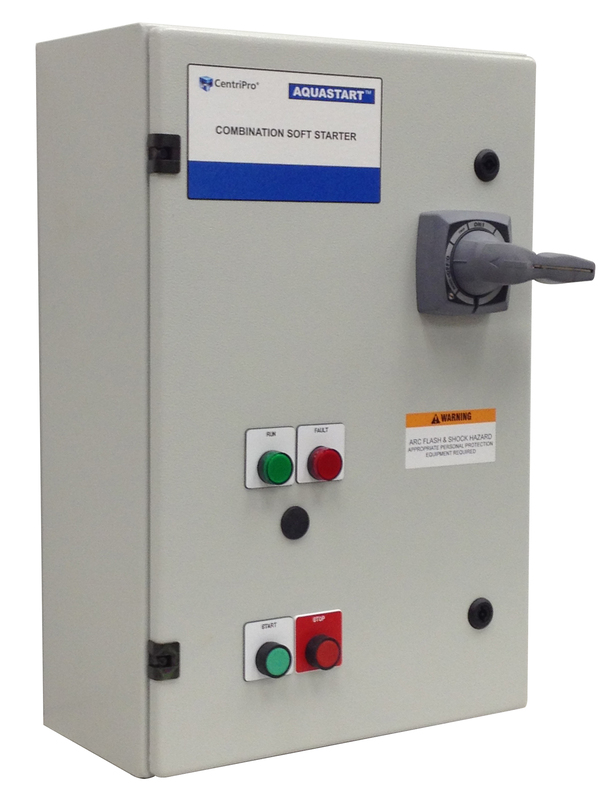 Optional AC3 Bypass Contractor and DOL selector switch – Allows user to bypass soft starter module for DOL start and stop. Full Diagnostics – In addition to typical electrical protection and diagnostics, the AquaStart has a full range of motor protection features such as locked rotor, current imbalance / phase loss, and over / under current. These features require no additional input devices. Remote on/off – Permits external control by timers (irrigation), float or pressure switches (tank draining) or manual control.